FUTA Post UTME & Direct entry (DE) Admission Screening Form 2019/2020 | Federal University of Technology, Akure (FUTA) post UTME/Direct Entry screening application form for the 2019/2020 academic session admission exercise. This is to inform all the candidates seeking admission into the Federal University of Technology, Akure (FUTA) DEGREE PROGRAMMES for the 2019/2020 academic session that the online registration for the Computer-Based Post-UTME screening exercise will commence soon. Candidates who made the Federal University of Technology, Akure their First Choice Institution in the 2019 UTME and scored 180 and above are eligible for screening. In addition, candidates must possess five (5) credit passes including English Language and Mathematics at not more than two (2) sittings. Candidates who do not participate in the Post-UTME screening will not be considered for admission. 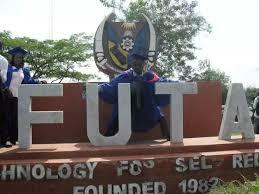 FUTA will not consider candidates with “Awaiting Results”. CLOSING DATE: The online registration deadline for the Computer-Based Post-UTME screening exercise for admission into ALL COURSES/PROGRAMMES for the 2019/2020 Academic session is YET to be announce.